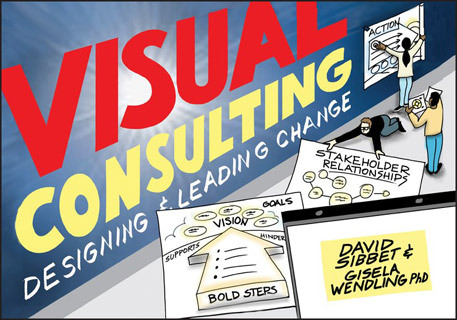 Visualization—in your own imagination, on the wall, and with media—supports any consultant who is learning to design and facilitate transformational change, leadership development, stakeholder involvement processes, and making sense of complex challenges. This book, from leaders in the field, shows you how. Building on Peter Block’s Flawless Consulting, it explains how to visually contract and scope work, gather data, provide feedback, plan interventions, implement, and support on-going sustainability in organizational and community settings. Unlike Block’s work, Visual Consulting addresses the challenging problems of guiding organizational and social change processes that involve multiple levels and types of stakeholders, with interests in both local and global environments. It demonstrates how visualization and design thinking can be used to get more creative and productive results that are “owned” by everyone. The practices described apply to organizational as well as diverse, cross-boundary consulting projects. In this book, you will. . . Learn powerful visual tools for all key stages of the consulting process, including marketing your services Understand the predictable challenges of change and how to successfully guide organizations and communities through them Learn how to collaborate with clients to get sustainable results Find tools for using visualization comprehensively, for both inner and outer work Successfully guide change in both organizations and communities The fourth installment in the Visual Facilitation series, this book teaches you how to activate the full range of visual tools, methods, and models to support stepping into successful, contemporary consulting relationships.